Use the link below to fill out the Primary Source Document Analysis form and to learn about the different perspectives. Your search for information will lead you to the answers of questions about the growth and change in America from 1800-1861. Get ready to find the answers with the help of the internet sites below. Take notes and then transfer your work to a Word document. Use complete sentences, or copy and paste the questions into your document so that I know what question you are answering. Notes need to be turned in with your final product. Insert an internet picture to accompany your answers, spell correctly, and use proper writing structure in your final drafts. Cite your graphic resources. Have fun! Remember to read through the sites carefully and take notes. 1. Who played key roles in the transaction of the Louisiana Purchase? 2. Why was the purchase so important? 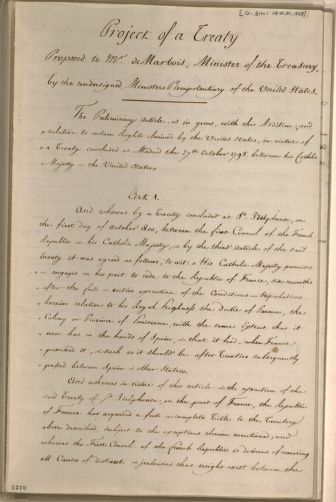 3. Who did Jefferson send to explore the territory? 4. What does the name Seminole mean? 5. After the Indian Removal Act of 1830, what did the Seminoles do and have done to them? 6. What did the Indian Claims Commission do for the Seminoles in 1970? 7. How did the United States approach the negotiations with Mexico? 8. How does this treaty continue to affect the United States and Mexico today? 9. How many miles was the trail and how many months did it typically take to travel it? 10. How many pioneers used the Oregon Trail? 11. What was the Donation Land Act of 1850? 12. What were two main causes of death along the trail? 13. What were two purposes for the forts on the Oregon Trail? 14. What did the Monroe Doctrine state to European powers? 15. How does the Cotton Gin work? 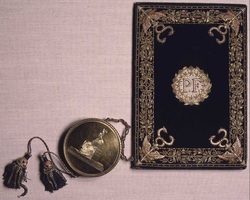 v How did the invention help the South to prosper? v What Virginian invented the reaper? v How was it helpful to farmers? v What impact did Fulton’s improved steamboat have on transportation in the United States? v What four things did the transcontinental railroad do for the country? v What groups of people joined in the gold rush? v Where was the gold found? v What happened to the miners and towns when the gold ran out? v How was gold discovered in California and who discovered it? Answers you should be able to answer without the website above, but you can use it if you are unsure of any of the questions below. v If you were on the Trail in 1850, what seven supplies would you have taken with you? Why did you choose those seven? v What new technology was spawned by Westward Expansion? v What impact did Westward Expansion have on the environment? v What groups of people moved west and when did they go? 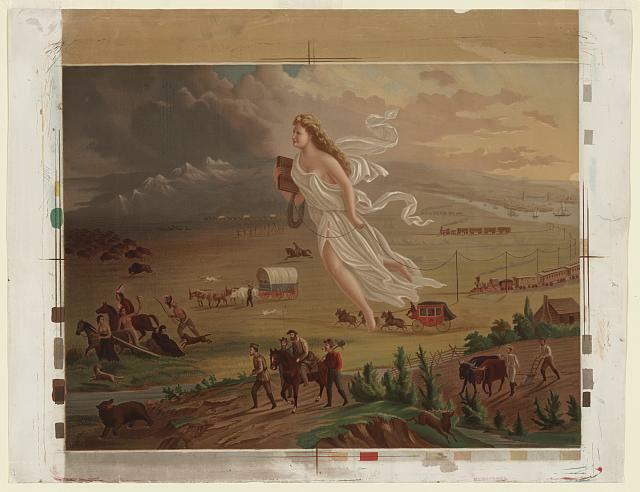 Allegorical female figure of America leading pioneers and railroads westward. Copyright by George A. Crofutt. After 1872 painting of the same title by John Gast. Original painting purchased by Gene Autry Western Heritage Museum, 1992. Published in: American women : a Library of Congress guide for the study of women's history and culture in the United States / edited by Sheridan Harvey ... [et al.]. Washington : Library of Congress, 2001, p. 225. Use the primary sources below to learn about life during the 1800s as the U.S. was expanding west. You can also click this link to National Geographic website to learn more about Lewis and Clark. This is a letter that President Jefferson wrote to the House of Representatives in the early 1800s. 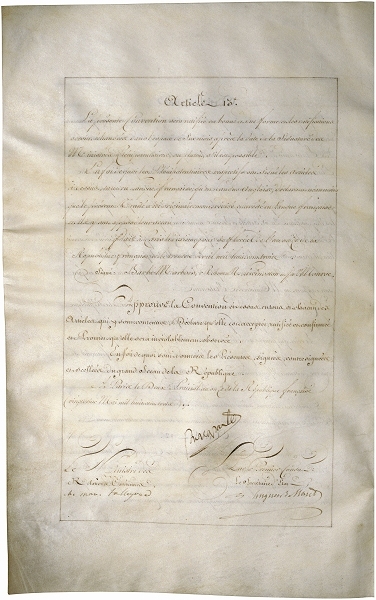 Below are copies of the original treaty. Zoom in and see if you can read any of the text. Is it in English or French?